Shingosine 1-Phopshate (S1P) is a bioactive sphingolipid metabolite generated from endogenous sphingosine through phosphorylation by specific kinases, named sphingosine kinases 1 and 2. S1P acts as an agonist on a family of G protein-coupled receptors (GPCRs) with seven-transmembrane domain. Five sphingosine 1-phosphate receptors have been identified (S1P1 to S1P5, also known as endothelial differentiation genes (EDG) receptors, EDG1, EDG5, EDG3, EDG6 and EDG8 respectively). S1P1, S1P4 and S1P5 receptors activate Gi but not Gq, whereas S1P2 and S1P3 receptors activate both Gi and Gq. 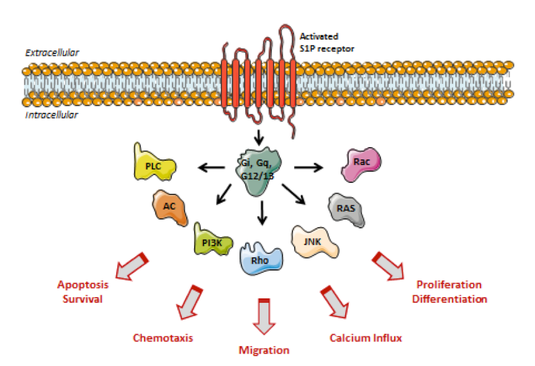 The S1P3 receptor, but not the S1P1 receptor, responds to an agonist with an increase in intracellular calcium. S1P has been demonstrated to induce many cellular effects, including those that result in platelet aggregation, cell proliferation, cell morphology, tumor cell invasion, endothelial cell and leukocyte chemotaxis, endothelial cell in vitro angiogenesis, and lymphocyte trafficking. S1P receptors are therefore good targets for a wide variety of therapeutic applications such as tumor growth inhibition, vascular disease, and autoimmune diseases.